Raditz, Nappa, and Vegeta travel to earth to look for a guy named kakarot... But end up on the wrong side of the EARTH!!! How will they live in America? Jump to: 1: Chapter 1: The Unpleasant Landing 2: Chapter 2: Army and a Teenage Girl? "My Prince we are beginning to Land..." Raditz said as they prepared to land. 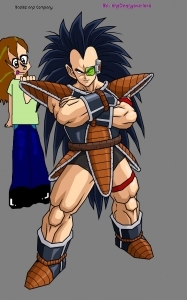 Raditz is one of the survivng saiyans left and they were searching for a man named Kakarot. Raditz told Vegeta 3 times before he paid attention. "WILL YOU LISTEN TO ME?!!!! " They started to crash down to where they thought was Japan! Nappa realized this and checked on his scouter and was so surprised... so he warned Vegeta. "VEGETA!!! We are going to the wrong side of the Earth and today was supposed to be FULL MOON!!!!" Everybody's face then went like . They landed in what seemed to be a city called Philadelphia. "I feel awful !!!" Raditz said. When they got out everybody scrambled everywhere looking for somewhere to hide.